These Homemade Tap Shoes will make any child sing and dance away, an easy way to make music and get kids moving! Please be careful when doing this craft with young ones, you don't want them to slip! 1. Find some loose change around the house. 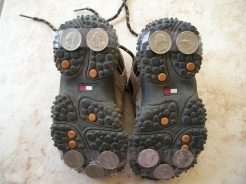 Tape quarters or other coins to the souls and heels of both shoes. Now you're ready to have fun and tap...tap...tap!